When young, we’re taught that the people who give us a hard time actually just have a crush on us. Well, that’s apparently true even when we’re older — and hosting a daytime talk show. Rosie O’Donnell made this clear in the upcoming book Ladies Who Punch: The Explosive Inside Story Of “The View”, in which she reveals harboring complicated feelings toward onscreen nemesis Elisabeth Hasselbeck. Speaking to Variety’s Ramin Setoodeh, the comedienne recounted the day in May 2007 where she had a 10-minute fight on national television with her conservative cohost about the Iraq War. To many, it seemed as if O’Donnell and Hasselbeck were the worst of enemies. But Rosie says that couldn’t be further from the truth. In the book, she claims she “loved” her former cohost and, TBH, had a bit of a “crush” on her! Ah, the old every-girl-who-plays-softball-is-a-lesbian stereotype. We expect better from you, Rosie! So, Rosie didn’t want to corrupt Elisabeth into being gay. She just wanted to groom the newcomer into an entertaining daytime television personality — one who Rosie hoped would be in her corner as she tried to take over the show. 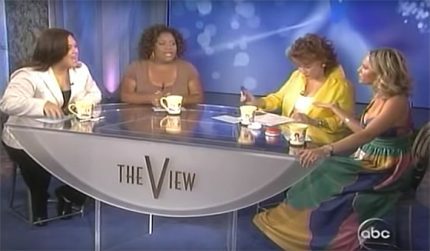 Interestingly enough, there was more behind the scenes drama playing out on the view that same year: O’Donnell tried to take the reins of the show from creator Barbara Walters and executive producer Bill Geddie. Initially, Hasselbeck was playing for O’Donnell’s team. But, again… not like that! Eventually, the alliance between the two shattered — which put a strain their onscreen relationship that ultimately led to their infamous blow-up. While, at the time, their heated argument seemed like it stemmed from a political disagreement, O’Donnell explains it was actually more like a lovers’ spat. Things worked out, in the end. Elisabeth went on to host Fox and Friends for two years, where she got to be as conservative as she wanted to be and no longer had to put up with the unwanted affections of snarky lesbians…. only older heterosexual men. Like the good lord intended.